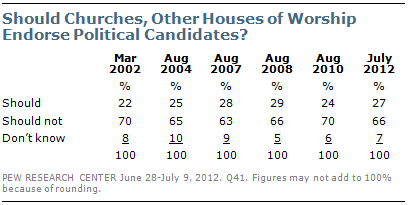 Americans have long been comfortable with religion having a role in politics. A sizable majority continues to say it is important for the president to have strong religious beliefs. And a majority says they are not bothered when politicians talk about their religion. At the same time, however, there is widespread opposition to churches and other houses of worship endorsing one political candidate over another. And recent Pew Research Center polling found that an increasing percentage thinks there has been “too much” religious talk from politicians. Roughly half of the public believes that conservative Christians have gone too far in trying to impose their religious values on the country. But there is even more concern that liberals have gone too far in trying to keep religion out of schools and government. This imbalance reflects the continued public view that religious groups, and religion in general, strengthen American society. By two-to-one, most say that churches, synagogues and other houses of worship contribute to solving important social problems. Yet there is a continued sense that religion’s influence is declining in America. An overwhelming majority of those who share this perception see this as a bad thing. 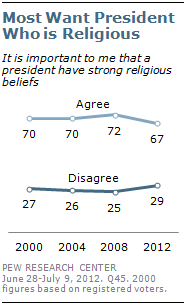 Two-thirds of adults (67%) say it is important for the president to have strong religious beliefs. This number is down since 2008 (72%), but is similar to polls conducted during the 2004 and 2000 elections (70%). The consistent importance of religion matches another survey finding from a May 2011 poll, which found 61% of adults say they would be less likely to support a presidential candidate who does not believe in God. Of 14 items tested, this was the only potential trait that a clear majority of Americans said would affect their vote negatively. Eight-in-ten Republicans (81%) say it is important to have a president with strong religious beliefs, which is significantly higher than the number of Democrats (66%) and independents (60%) who say this. Similar partisan divisions have existed since this question was first asked in 2000. 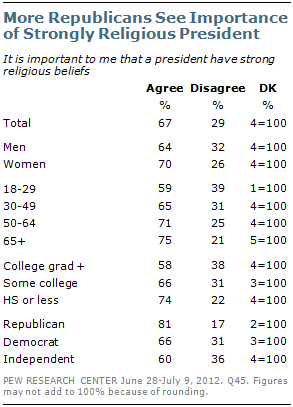 Women are more likely than men to say it is important for a president to have strong religious beliefs (70% vs. 64%). 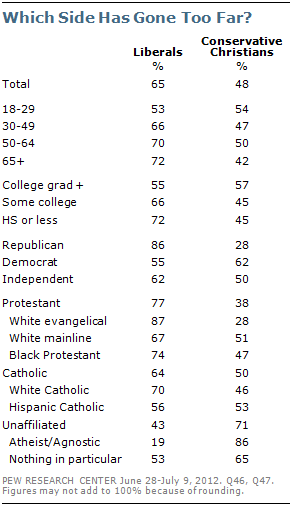 And having a strongly religious president is more important to older people than to younger adults. Those with a high school education or less attach more importance to having a president with strong religious beliefs (74%) than do those with some college (66%), who in turn prioritize this more than college graduates (58%). Having a president with strong religious beliefs is important to large majorities across a variety of religious groups. Those who are unaffiliated with a religion, especially atheists and agnostics, are the major exception. Two-thirds of the religiously unaffiliated, including 86% of atheists and agnostics, say it is not important that presidents have strong religious beliefs. White evangelical Protestants (88%), black Protestants (78%) and Hispanic Catholics (79%) are among the most likely to say it is important that a president have strong religious beliefs. Overall, half of Americans (52%) say it does not bother them when politicians “talk about how religious they are,” while 43% say this makes them uncomfortable. Views on this question have held steady in recent years. In addition to asking the long-standing question about comfort with politicians talking about “how religious they are,” the survey also asked half of respondents whether it makes them uncomfortable when politicians talk about “their religious faith and beliefs.” When the question is worded this way, 57% disagree, while 37% agree. 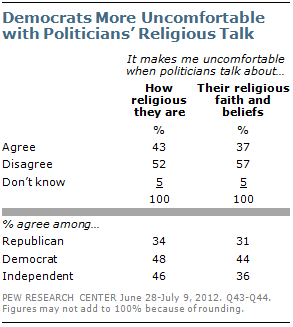 Nearly half of Democrats (48%) say it makes them uncomfortable when politicians talk about how religious they are, while about as many (44%) say they are uncomfortable with politicians talking about their religious faith and beliefs. Only about a third of Republicans express discomfort when politicians talk about how religious they are (34%) and their religious faith and beliefs (31%). Pew Research Center surveys conducted over the past decade show a steady consensus that churches and other houses of worship should not come out in favor of one candidate over another during elections. Currently, about two-thirds of Americans take this view (66%), while 27% say churches should endorse one candidate over another. There is broad agreement across many demographic groups on this question. Nearly seven-in-ten Democrats (69%) and independents (68%) say churches and other houses of worship should refrain from voicing support for one political candidate over another. Republicans are less opposed to church endorsements of candidates, though even among Republicans a majority opposes church endorsements (59%). Among religious groups, roughly three-quarters of white mainline Protestants (73%), white Catholics (74%), and the unaffiliated (75%) say that churches should not come out in favor of one candidate over another. Opposition to political endorsements by churches is less pronounced among white evangelical Protestants (56%) and black Protestants (52%). People who attend religious services regularly and those who say religion is very important in their lives are more inclined than less religious Americans to support houses of worship making political endorsements. But even among these more religious groups, majorities say churches should refrain from endorsing political candidates (57% and 58%, respectively). 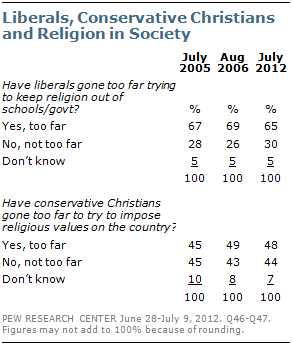 Nearly two-thirds of Americans believe liberals have gone too far in trying to keep religion out of the schools and the government (65%), a view that has remained stable in recent years. The public is more divided about whether conservative Christians have gone too far in trying to impose their religious values on the country; 48% say yes while 44% say no. About a quarter of Americans (27%) say both sides have gone too far when it comes to religion – liberals in trying to keep it out of schools and government, and conservative Christians in trying to impose religious values. The view that liberals have gone too far in trying to limit religion’s influence in government and schools is more prevalent among older than younger Americans. About half (53%) of adults younger than 30 say liberals have gone too far, compared with 66% of those ages 30-49, 70% of those ages 50-64 and 72% of those ages 65 or older. Those under 30 are more likely than those ages 65 and older to say that conservative Christians have gone too far, though generational differences are more modest on this question. A large majority of Republicans think liberals have gone too far in keeping religion out of schools and government (86%), compared with about half of Democrats (55%) and six-in-ten independents (62%). Conversely, the view that conservative Christians have gone too far to impose their values is much more common among Democrats (62%) and independents (50%) than Republicans (28%). Among religious groups, the view that liberals have crossed a line in trying to keep religion out of government is most common among white evangelical Protestants (87%), but is also shared by majorities of black Protestants (74%), white mainline Protestants (67%) and Catholics (64%). By contrast, less than half of the religiously unaffiliated (43%) say liberals have gone too far, including only 19% of atheists and agnostics. This pattern is essentially reversed when it comes to views of conservative Christians. Only 28% of white evangelical Protestants think conservative Christians have gone too far in trying to impose their values. Roughly half or more of white mainline Protestants (51%), Catholics (50%) and black Protestants (47%) say conservative Christians have gone too far. And the religiously unaffiliated are more likely than any other religious group to say conservative Christians have crossed the line (71%), including fully 86% of atheists and agnostics who express this view. Two-thirds of Americans (66%) say religion as a whole is losing its influence on American life. The percentage of people who hold this view is up significantly over the last decade (from 52% in 2002), but has not changed since 2010. One-in-four Americans thinks religion’s influence on American life is increasing (25%). The large majority of those who think religion’s influence is on the decline see this as a bad thing (49% of the public as a whole), compared with 12% who think religion’s influence is waning and that this is a good thing. Conversely, most of those who think religion’s influence is on the rise think this is a good thing (16% of the public overall), while 8% say religion’s influence is growing and see this as a negative. 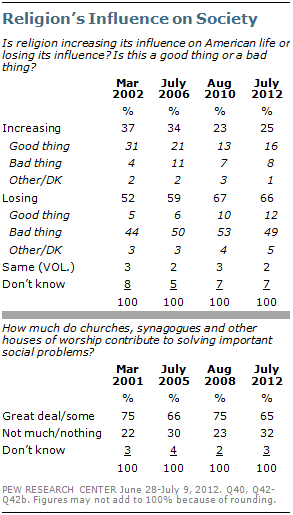 Though most Americans say religion’s influence is declining, two-thirds (65%) still believe churches, synagogues, and other houses of worship contribute either “some” (40%) or “a great deal” (26%) to solving important social problems. While large majorities have expressed this view for more than a decade, there has been a decline in the number saying churches contribute a great deal or some to solving social problems since 2008 (the last time the question was asked by the Pew Research Center), when 75% of Americans said this.